Wow...so my mouth literally dropped when I heard this news. A.J. Jewell, ex-fiance of Kandi Burress who is a former member of the R&B group Xscape and a cast member of The Real Housewives of Atlanta, was killed in a club brawl in Atlanta Friday evening. The Atlanta Journal Constitution reported this news. Burruss' publicist Lisa Nelson confirmed to WSB that the actress has been informed of the incident and said the family asked for privacy. Police said it's unclear what prompted the fight. No arrests have been made. I am a regular viewer of Housewives and the show shows just how in love Kandi and A.J. both were. And to lose someone you love is extremely hard, but to lose someone over what seems to be senseless violence is even harder. 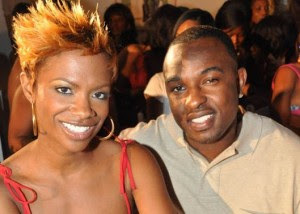 I send prayers and condolences out to Kandi, her family, and A.J. 's family. RIP.